Boston Limited experts in lower powered servers unveiled the latest release of Viridis Microserver range. Powered by ARM Cortex A15 quad-core processor. Based on six EnergyCore ECX-2000 cards, the Boston Viridis 2.0 hosts two four-core SoC’s (Server-on-Chip) running at 1.8GHz and consuming as little as 6 Watts of power. The ARM Cortex A15 quad-core processor, ECX-2000 delivers twice the performance, three times the memory bandwidth, and four times the memory capacity of the earlier ground-breaking ECX-1000. It is highly scalable thanks to the integrated 80GB Fleet Fabric switch. The embedded Fleet Engine simultaneously provides out-of-band control and intelligence for autonomic operation and power optimization. Details of Cassandra 2.0 Revealed ..
Cassandra has been the wildly popular key value (nosql) database due to it's performance and scalability. The announcements for Cassandra 2.0 claim offer more traditional database features as well as means to integrate with large event processing engines. Lightweight transactions allow ensuring operation “linearizability” similar to the serializable isolation level offered by relational databases which prevents conflicts during concurrent requests. However, newcomers will receive “Gen-1” boards, which will offer slight improvements over earlier versions, such as reduced power consumption and an added serial port three-pin header. The basic 16-core board going for $99 on the online store , with an expected October delivery date. The company tells us the 64-core version will also be available for public consumption, with pre-orders beginning in Q4 this year. In Sun Tzu terms tech is like fighting in a marsh, where you have to keep moving or sink. the JVM, and we have lots of in-house experience on it. It scales in terms of processing and storage capacity. Its tunable consistency levels provide greater control over high availability and consistency requirements. We need higher resiliency to faults: MongoDB provides replica sets, but we’re experiencing lots of problems with replication lags and during replica synchronization. For scalability: MongoDB global lock and huge memory requirements aren't already going to cope well with our growing data set. 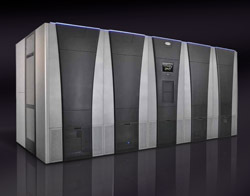 With data volumes and pressure to reduce power all increasing, it is back to the future with NCSA380 Petabyte High Performance Storage System. The world’s largest automated near-line data repository which has multiple automated tape libraries, dozens of high-performance data movers, a large 40 Gigabit Ethernet network, hundreds of high-performance tape drives, and about a 100,000 tape cartridges. Data Warehousing used to be be the place were legacy data went to die. Now Big Data means that the data warehouse has become the center of online data analysis and a key part of strategic direction. SUSE Linux Enterprise Server, NetApp and Intel's Xeon processors. Software to allow analysts to browse and move between Teradata and Hadoop data for business intelligence. The Teradata Enterprise Teradata Studio with Smart Loader for Hadoop Access supports Hortonworks and Cloudera. Teradata SQL-H, which blends Hadoop with standard SQL databases. SQL-H, which supports Hortonworks, is designed to allow analysts to query data anywhere it resides. “Resistance is futile ..! !” The major leading memory makers, namely Micron, Samsung and Hynix are co-developing the technology development efforts backed by the Hybrid Memory Cube Consortium (HMC). The technology, called a Hybrid Memory Cube, will stack multiple volatile memory dies on top of a DRAM controller. These 3 dimensional chips will rely on the relatively new silicon VIA (Vertical Interconnect Access) technology as their inter connect. The first Hybrid Memory Cube specification will deliver 2GB and 4GB of capacity, providing aggregate bi-directional bandwidth of up to 160GBps compared with DDR3′s 11GBps of aggregate bandwidth and DDR4, with 18GB to 20GB of aggregate bandwidth.